Coot is the common name for any of the medium-sized, duck-like aquatic birds comprising the genus Fulica of the rail family Rallidae, characterized by typically dark plumage, toes that are lobed with a membrane, a dark head with a short, wide beak that in many species extends from the base to the forehead as a prominent, flattened, fleshy frontal shield or other decoration on the forehead. Coots have predominantly black plumage, and, unlike many of the rails, they are usually easy to see, often swimming in open water. They are close relatives of the moorhen. They are eleven extant species. Largely inhabiting freshwater lakes, ponds, and large streams in South America, North America, and Europe, they also are found in Africa, Asia, and Australia. Ecologically, coots play a role in food chains, helping to maintain populations of prey species and aquatic vegetation and serving as a food source for a wide diversity of predators, including foxes, coyotes, raccoons, snapping turtles, eagles, and osprey. For humans, they also serve as a food source. On the Louisiana coast, the Cajun word for coot is "pouldeau," from French for "coot," poule d'eau—literally "water hen." Coot is somewhat popular in Cajun cuisine, such as an ingredient for gumbos cooked at home by duck hunters. Coot, however, is not popularly hunted as game birds. Their unique form and behavior adds to the diversity of nature for those visiting watercourses. Coots belong to the family Rallidae, whose members are known collectively as rails, but also includes birds known as crakes and gallinules. The rails are a fairly homogeneous family of small to medium sized ground living birds, although some such as the coots are more adapted to water environments. Rails vary in length from 12 centimeters to 63 centimeters (4.7-25 inches) and in weight from 20 grams to 3000 grams (0.04-6.6 pounds). Some species have long necks and in many cases they are laterally compressed. The bill is the most variable feature within the family: in some species it is longer than the head (like the clapper rail of the Americas), in others it may be short and wide (as in the coots), or massive (as in the purple gallinules) (Horsfall and Robinson 2003). Rails exhibit very little sexual dimorphism in either plumage or size. Coots comprise the genus Fulica in Raillidae. As with some of the gallinules, coots tend to have a "frontal shield," which is a fleshy rearward extension of the upper bill, which is flattened and extends to the forehead. The most complex frontal shield is found in the horned coot (Horsfall and Robinson 2003). Rails also have a short, wide, conical bill, which may be white or colored depending on the species; a black head and neck; and toes that have a lobed membrane that aids them in swimming and moving through marshy areas. They have feet that range from a yellowish, to a greenish, to a bluish gray in coloration. Coots tend to have short, rounded wings. Many, but not all, have white on the under tail. The widespread Eurasian coot, or common coot (Fulica atra), is 36 to 42 centimeters (14-16.5 inches) long, and is largely black except for the white facial shield (which gave rise to the phrase "as bald as a coot"). The juvenile is paler than the adult, has a whitish breast, and lacks the facial shield; the adult black plumage develops when about 3 to 4 months old, but the white shield is only fully developed at about one year old, some time later. The American coot (Fulica americana) is similar in size, about 40 centimeters (16 inches) in length and weighing about 0.65 kilograms (1.4 pounds). Adults have a short thick white bill and white frontal shield, which usually has a reddish-brown spot near the top of the bill between the eyes. From up close, a dark band can be distinguished at the billtip. The body is gray with the head and neck darker than the rest of the body. Their legs are yellowish. American coot chicks have black bodies with bright red head and beak, and orange plumes around the neck. There are eleven extant species recognized in this genus. The greatest species variety is in South America, where there are seven species, and it is likely that the genus originated there. They are common in Europe and North America. The Eurasian coot occurs and breeds in Europe, Asia, Australia, and Africa, and has recently expanded its range into New Zealand. The America coot is found in wetlands and open water bodies from southern Quebec to the Pacific coast of North America and as far south as northern South America. Birds from temperate North America east of the Rocky Mountains migrate to the southern United States and southern British Columbia. They are often year-round residents where water remains open in winter. Cooks inhabit larger inland, freshwater lakes, ponds, marshes, and streams, where they are well adapted to swimming and diving for food. A flock of coots is known in the United States as a "cover" (Ross). Groups of coots also are known as rafts. Coots are weak fliers, although northern species are nevertheless capable of covering long distances; the American coot has reached Great Britain and Ireland on rare occasions. Those species that migrate do so at night. As common with coots, the Eurasian coot is reluctant to fly and when taking off runs (or pedals) across the water surface with much splashing. They do the same, but without actually flying, when traveling a short distance at speed in territorial disputes. Nonetheless, on migration, usually at night, it can cover surprisingly large distances. Coots are strong swimmers and divers. They tend to bob their heads as they swim, and makes short dives from a little jump. The way in which the American coots bob their heads when they walk or swim is reminiscent of chickens and has earned them the name "marsh hen" or "mud hen." Unlike many rails, coots are less secretive and are frequently seen swimming in open water. Coots can walk and run vigorously on strong legs, and have long toes that are well adapted to soft, uneven surfaces. 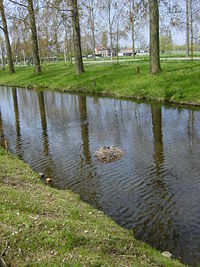 A coot nest in the middle of a canal. The male coot protects the female coot while breeding. Cooks birds are omnivorous, taking mainly plant material (aquatic plants, seeds), but also small animals (mollusks, worms, insects) and eggs. The Eurasian coot is known to take a variety of small live prey ,including the eggs of other water birds, as well as algae, vegetation, seeds, and fruit (Perrow et al. 1997). It shows considerable variation in its feeding techniques, grazing on land or in the water. In the water, it may upend in the fashion of a mallard or dive in search of food (Bakker and Fordham 1993). American coots likewise both dive for food and forage on land, eating plant material, arthropods, fish, and other aquatic animals. Coots nest in a well-concealed location in such areas as tall reeds and grasses near the water's edge or on underwater obstacles protruding from the water. Both the Eurasian coot and the American coot are highly territorial during the breeding season, with both parents involved in territorial defense, fighting with neighbors to maintain a small territory. The Eurasian coot lays up to ten eggs, though usually only 3 survive (Attenborough 1998). One reason for the low survival rate is because of the parents sometimes brutal behavior toward their own young when their are pressures such as lack of food, with the parents biting their young repeatedly until it stops begging for food and starves. Females of the American coot are known to lay eggs in neighbors' nests (conspecific brood parasitism); contrary to what one might expect, this behavior is more common among females that already have a nest than among those that were not able to secure a suitable territory for breeding in that season (Lyon 1993). While aggressively territorial during the breeding season, during the non-breeding season both the Eurasian coot and American coot may form large flocks, such as on the shallow vegetative lakes that provides them food. This may be related to predator avoidance (van den Hout 2006). Attenborough, D. 1998. Life of Birds. Princeton University Press. ISBN 9780691016337. Bakker, B. J., and R. A. Fordham. 1993. 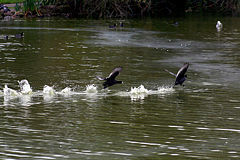 Diving behaviour of the Australian Coot in a New Zealand lake. Notornis 40(2): 131–136. Retrieved January 22, 2009. Bridgman, A. 2003. Fulica americana. Animal Diversity Web. Retrieved January 22, 2009. Cave, A. J., J. Visser, and A. C. Perdeck. 1989. Size and quality of the coot (Fulica atra) territory in relation to age of its tenants and neighbours." Ardea 77: 87-97. Horsfall, J. A., and R. Robinson. 2003. Rails. In C. Perrins (ed. ), Firefly Encyclopedia of Birds. Toronto: Firefly Books. ISBN 1552977773. Integrated Taxonomic Information System (ITIS). 2006. Fulica Linnaeus, 1758 ITIS Taxonomic Serial No. : 176289. Retrieved January 23, 2009. Lyon, B. E. 1993. Conspecific brood parasitism as a flexible female reproductive tactic in American coots. Animal Behaviour 46(5): 911-928. Retrieved January 22, 2009. Perrow, M. R., J. H. Schutten, J. R. Howes, T. Holzer, F. J. Madgwick, and A. J. D. Jowitt. 1997. 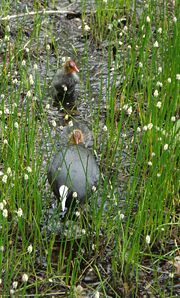 Interactions between coot (Fulica atra) and submerged macrophytes: The role of birds in the restoration process. Hydrobiologia 342/343: 241–255. Ross, T. n.d. Group names for birds: A partial list. Baltimore Bird Club. Retrieved January 22, 2009.
van den Hout, P. J. 2006. Dense foraging flotillas of Eurasian coots Fulica atra explained by predation by Ganges soft-shell turtle Aspideretus gangeticus? Ardea 94(2): 271-274. Retrieved January 22, 2009. This page was last modified on 23 March 2017, at 14:43.